We advice caution when travelling to Algeria. 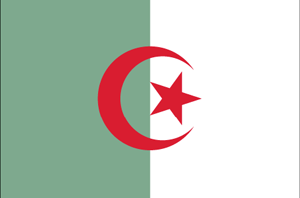 Algeria is a country in Africa (Northern Africa) with around 34 million citizens and a land mass of 2,381,740 km². We detected travel advisories from 9 sources for this country. Algeria shares land borders with 7 neighbouring states. For this country, the Danger Index is 3.3 (average value for all countries). All countries habe been reported as somehow dangerous: Libya (5.0), Mali (4.6), Mauritania (3.9), Niger (3.5), Tunisia (2.6), Morocco with (2.5) and Western Sahara with (1.0 of 5). See danger map of the region. Exercise increased caution when traveling in Algeria due to terrorism. Some areas have increased risk. Read the entire Travel Advisory. Do not travel to: Areas near the eastern and southern borders due to terrorism and kidnapping. Areas in the Sahara Desert due to terrorism and kidnapping. Terrorist groups continue plotting possible attacks in Algeria. Terrorists may attack with little or no warning and have recently targeted the Algerian security forces. Most attacks take place in rural areas, but attacks are possible in urban areas despite a heavy and active police presence. The U.S. government has limited ability to provide emergency services to U.S. citizens outside Algiers province due to Algerian government restrictions on travel by U.S. government employees. Read the Safety and Security section on the country information page. We now advise you to ‘exercise a high degree of caution’ in Algiers. Reconsider your need to travel to Algeria overall. Higher levels apply in some parts of the country. This regional advisory from the Australian government covers:Algiers. This regional advisory from the Australian government covers:Within 450 kilometres of borders with Mali and Niger. This regional advisory from the Australian government covers:Within 100 kilometres of borders with Mauritania, Libya and Tunisia . Algerien: Reise- und Sicherheitshinweise: Teilreisewarnung. The German government advises againt travelling this country. The Austrian Government advises again travelling Algerien.